This past weekend, my husband and I took a trip to Florida to visit my family. We laid by the pool and the beach plenty, and I got to wear the heck out of my summer dresses and sunscreen. However, crazy as it may seem, I probably spent most of my time heating up the kitchen and cooking with my mom. After a full night of flying, we arrived in the morning, and mom and I got right to work making chocolate mousse for my aunt’s dinner party that night. I was determined to make it perfect and decadent, but, how do I put this…. On barely an hour of sleep, delicate desserts like chocolate mousse are not possible. Not at all. So, with just an hour to spare, we brainstormed a “plan B” of cherry crisp, a family favorite and incredibly simple sweet that would save our tails. Why my mom keeps cherry pie filling, plain oats and whole almonds at-the-ready, I’ll never know, but God bless that woman. We had this thing in the oven in 10 minutes, and after 30 minutes of baking and filling the house with the aroma of sweet cherries and warm cinnamon, it was ready for packing up to take to the party. By the time we got to dessert, everyone had a glass of wine in hand and their feet dunked in the pool on that hot, sticky Florida night. In under a minute, the clang of spoons hit empty dessert dishes and moans ensued. A crunchy topping of chopped nuts, warm oats, brown sugar, cinnamon and nutmeg gave way to bubbling, soft and gooey cherries. Topped with a dollop of homemade whipped cream, it just about sent us all to heaven and back. Whether this delicious cherry crisp is in your plans or ends up being “plan B”, I guarantee you’ll love it and make it again soon. Though the dinner party was Saturday, I haven’t even been home for 48 hours and I couldn’t resist making it again. Lightly grease a 2-quart baking dish or six 3.5-oz ramekins. Pour pie filling into the dish or ramekins, and spread evenly. In a medium bowl, mix together flour, oats, sugar, cinnamon, and nutmeg. Mix in melted butter. Spread over pie filling, and sprinkle with chopped nuts of your choice. If using ramekins, place them on a baking sheet. Great recipe! Very tasty! I added 1/2 tsp almond extract to the cherry pie filling but otherwise made as instructed, it was a hit. This is an easy, quick recipe that really satisfied my family. Thanks! I would love this! Hope to try it sometime soon! Crisps are comfort food, indeed. 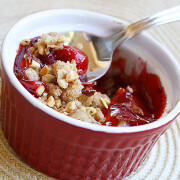 The sugary, crisp topping covering those cherries in your beautiful red ramekin makes a beautiful presentation. I think I’m going to make a crisp tomorrow for the holiday! Thank you so much for letting me know how your crisp turned out! I’m so glad you enjoyed it. I agree – I think this would work with many other types of fruit! I made the cherry crisp this weekend and it was amazing! The topping is superb! I can imagine it would work well with apples or pears as well! Love it! this looks amazing- the color is unbelievable in your photos! Sounds good and looks so cute in that little red ramekin! You have me convinced! When a recipe is good enough to bake twice in one week, I know it is great! I am glad that you had such a nice trip…and I think it is wonderful you were able to cook with your mom. I don’t know if there is anything better than cooking (and eating!) with those that you love. I’ll raise my glass to all the “Plan B” ideas that ended up being so great! This sounds wonderful and simple–and you can’t beat that gorgeous color. Nice job! I hope you don’t mind.. I featured this recipe on my facebook page, Benjamin Twiggs Legendary Cherry Products. Looks wonderful!! Magnificent website. A lot of useful information here. I’m sending it to a few pals ans also sharing in delicious. And obviously, thank you to your effort!